NBC’s “This Is Us” cast and crew are among the many reflecting on last weekend’s mass shooting in Pittsburgh, which is also where the show is set. Eleven people were killed and four police officers injured when a gunman armed with an assault rifle opened fire on the city’s Tree of Life Synagogue congregation during a special service Saturday, Oct. 27. The statement also told viewers they could “learn more about ending gun violence” by visiting everytown.org. Everytown for Gun Safety is a non-profit organization fighting for gun control and against gun violence in the United States. “This Is Us” Executive Producer Dan Fogelman shared the comments on Twitter. Fogelman also shared information on donating to support the mourning community. 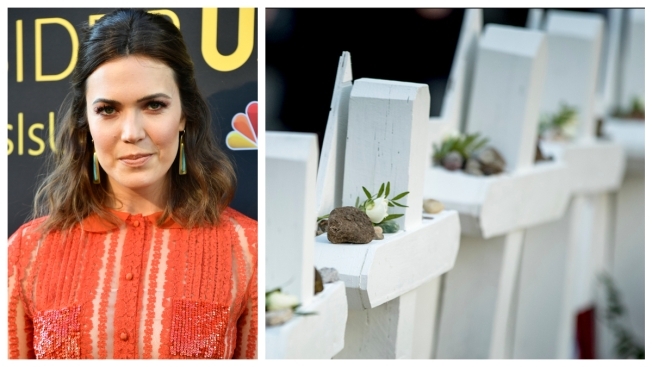 One of the show’s main actresses, Mandy Moore, also tweeted her support for the shooting victims and survivors. “We [love you] Pittsburgh,” Moore wrote, using the heart emoji.